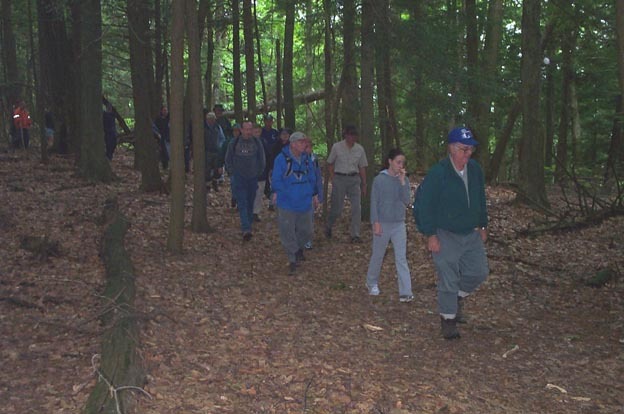 On June 7, 2003 people all over the state of Connecticut participated in hikes to recognize National Trails Day. 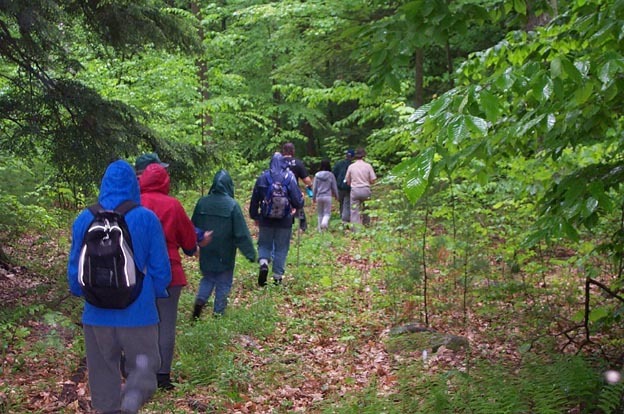 Organizations in Connecticut and throughout the country sponsor National Trails Days hikes to encourage people to get outdoors, get some exercise and see some of the beautiful sights. 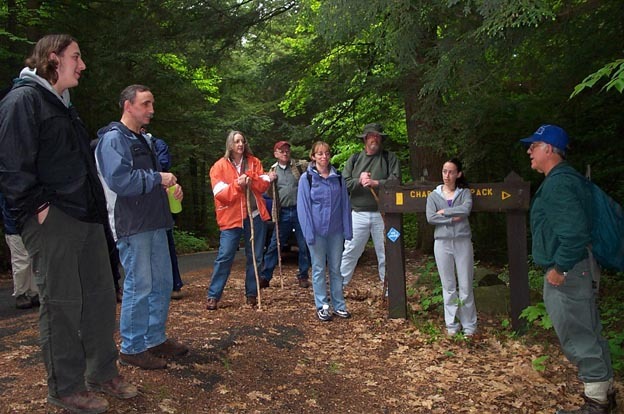 One of the hikes was held in People's Forest in Barkhamsted and led by Walt Landgraf. This event not only was a National Trails Day hike but also was tied into recognition of the 100th anniversary of forestry in Connecticut. One hundred years ago in 1903 the legislature authorized $2,000 for the purchase of land to be set aside for state forests. In that year some of those funds were used to purchase land in Portland for the first state forest in Connecticut, now called Meshomasic State Forest. 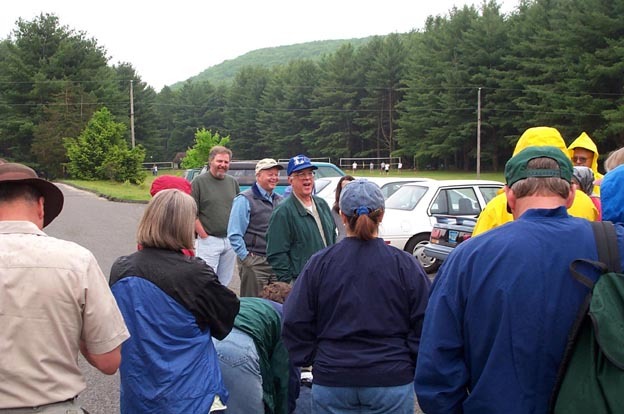 Photo above- Hike leader Walt Landgraf gets the group of 18 hikers organized at the main parking lot at Peoples Forest. 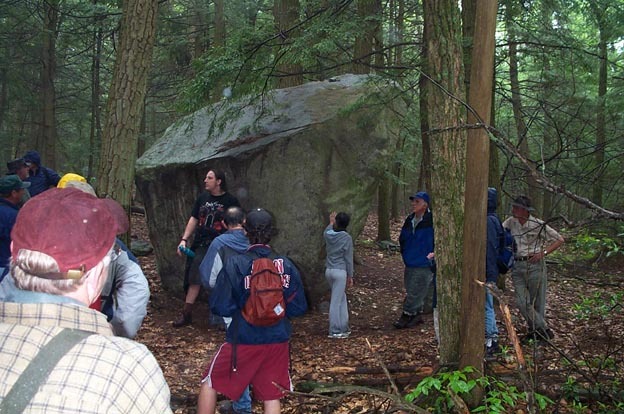 The hike at People's Forest started out at the Mathies Area where about 18 hikers assembled and listened to Walt's opening remarks. The number of hikers showing up seemed pretty good given a very light misty rain that was falling and the threat of heavier rain to come. Most of those attending were from Barkhamsted and several area towns. One person was visiting from New Jersey and had heard good reports about Walt's hikes. He was determined to make this hike despite the ominous weather forecast. At about 9:00 a.m. we all car-pooled about a mile and a half up Greenwoods Road into the heart of People's Forest. The hikers piled out of the cars and gathered at the beginning of the Charles Pack Trail where Walt outlined the scope of the hike. Walt is a long time Barkhamsted resident, a retired high school biology teacher, State Department of Environmental Protection employee and curator of the DEP Stone Museum at People s Forest. He is an expert on flora and fauna and local history. After a short walk we crossed Beaver Brook just below Beaver Swamp. This area has a lot going on. Beaver Swamp is a beautiful sight with a lot of different vegetation and wildlife. It would not be a surprise to spot a moose here, or a variety of ducks, herons, hawks, bald eagle, coyote, fox, muskrat, beaver, raccoon or white tail deer. There also is a lot of history at Beaver Swamp, from the seasonal Indian camps on the edge of the swamp (found by a Central Connecticut State University archaeology survey dig) to hay harvesting during the 1800's. This area is also known as Beaver Meadow and was a valuable hay producing area. Walt stopped at one spot near the trail and pointed out a charcoal hearth where perhaps 150 years ago 25 or 30 cords of wood was stacked just so and converted to charcoal. Just up the trail from the charcoal hearth and very close to Beaver Swamp is an old house foundation where slave owner Jabez Bacon lived over two hundred years ago. Photo above- Walt Landgraf (in blue hat) gets the group ready to go at the beginning of the Charles Pack trail. At many points during the hike, Walt stops the group and expounds on the plants and animals found in People's Forest, the history of the Forest and background on the trail system. For example, we made a side trip to the old house foundation of John and Lois Ives who moved here in the 1770's to what is now an isolated wooded spot. Walt talked about how one day Lois caught her clothes on fire while cooking at the fireplace, was very badly burned and not expected to live. But neighbor Molly Barber of the "Lighthouse tribe" used her knowledge of herbs and country medicine to nurse Lois back to health. Other points on the hike included Big Springs, a large boulder called a glacial erratic and an area with many pink lady slipper plants. Unfortunately an area with a scenic view of Riverton and another with a wide view of the Farmington River Valley were shrouded by the rain and fog. The rain began to come down harder and after a quick lunch at the second lookout, we hiked quickly back to the cars on Greenwoods Road. Due to the rain, the hike was shortened to about 4.5 miles but a good time was had by all. What better way to celebrate National Trails Day! Photo above- One the trail near Beaver Swamp with Walt Landgraf leading the way. Photo above- The group is just leaving the area near the John Ives house foundation. The rain is coming down a little harder at this point. Photo above- A large rock placed here by the glacier centuries ago when a thick sheet of ice that covered this area.